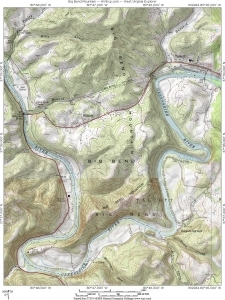 Big Bend Mountain is a summit in eastern Summers County west of Talcott, West Virginia, around which the Greenbrier River flows. The mountain forms the “Big Bend” in the river. Legendary folk hero John Henry was reputedly killed in a contest with a steam-powered drill while building the Big Bend Tunnel through the mountain. The mountain may be geologically considered a southern extension of Keeney Mountain.